Some time last year, I landed in Los Angeles. I was catching a connecting flight, the bane of the expedient traveler. But I was unusually happy for the brief stop. I'd been changed by something in my phone. I had only an hour or so to spend in the Los Angeles airport, as I awaited the next flight in a journey that began in San Francisco, for work, and would end home in New York City. I spent the hour walking past numerous airport shops, pausing in front of bookstores and stands selling overpriced sandwiches. Whenever I stopped, I Iifted my phone and examined it, as if testing each storefront's radiation levels. I checked in to each shop, testifying digitally that I was at each place. Doing this earned me points, more points than I would have received had I flown directly from San Francisco to New York, without detouring past these LAX stores. For at time back then, I was a slightly different person. Two programs on my iPhone had changed me, by changing the the value I placed on being in any particular place. This, in turn, affected where I went. It also raised my expectations that I could find a new way to understand the quantities of my existence, revealing a new set of data that, like my blood pressure, my height, my weight or my income could define who I was. These two apps had other effects. They made me suspicious of modern technology's ability to record the truth. They also changed the way I think about you — and not for the better. The two iPhone apps, Foursquare and MyTown, are used by millions of people. Through a combination of the iPhone's Internet and GPS technology, they allow a user to declare that they are in a specific place in the world. With a few taps of your finger, you "check in." That act can be broadcast to friends, kept as a private registry of where you've been or used to improve — if you believe an app can confirm such things — your status. Frequent check-ins to the same location earn users points or awards that elevate them to the status of a place's Foursquare mayor or, in the case of MyTown, to the top of a points leaderboard. Through these apps you can manage the satisfaction of letting the world know that you are, at the moment, in place A and not in place B as well as the hazards of letting tech-savvy burglars know you're not home. Did PleaseRobMe.com Sponsor Its First Real Robbery? These location apps offer some of the easiest rewards in the world, because they give credit for something that is more effortless than breathing: presence. I've scored points in grade school for correctly solving math problems; I've earned money in my adult life for doing good work. I rack Delta Skymiles as minor compensation for the expense of flying. I eat a free sandwich at Subway twice a year as a reward for the others I've bought. Most of what I've earned in life, I've earned for things that have real costs, that consume energy or spill sweat. Starting last spring, I was getting points on my iPhone in Foursquare and MyTown just for showing up … anywhere. Foursquare and MyTown are part of a controversial phenomenon called Gamification. This movement means what it sounds like: it is the act of taking something that is not thought of as a game and turning it into one. It's a hot concept. The movement's champions just had a convention for it, a Gamification Summit, in San Francisco. They promote the idea of putting scores on things, of rewarding points for action, of driving competition and collaboration. The champions of Gamification promise there are benefits to giving unpleasant or mundane activities the appeal of a good game. They propose harnessing whatever dark forces compel a person to keep playing Tetris or Halo, World of Warcraft or Farmville, Flight Control or Final Fantasy, and using them for real world effect. They proselytize that Gamification can be a steroid that propels people to more fervently do real labor, to mass together as never before in order to solve the hard problems of hunger and the energy crisis, and, hey, to maybe gain points for being places. The pro-Gamification people talk nobly about making the world better, sometimes less nobly about Building Brand Loyalty. The anti-Gamification people say the Gamification believers have a poor understanding of what games are really about and what makes them great. That greatness, they counter-claim, isn't the result of giving people points, certainly not simply for being places. If we're going to play, we will bushwack the fastest path toward victory. We will find efficiency. We will recognize our ability to cheat. I'm not sure whether I'm for or against Gamification. I'd certainly be for it, if it had done me good. What it's done for me in my last nine or so Gamified months, however, has revealed a possible unpleasant truth about the people around me. As I chased all those points for presence in Foursquare and MyTown, I became paranoid that the people around me — the nearby strangers most of all — might be lying about something that they shouldn't even be able to lie about when armed with a GPS-connected device. I decided that they, that you, were potentially being dishonest about so trivial yet so fundamental a thing as where you claim to plant your feet. Really. How can you be this way? My distrust of the people around me emerged through what I believe is the essential corollary to Gamficiation: Cheatification. If parts of our life can be reconfigured as games, I guarantee you those parts will suddenly be infused with our efforts to take shortcuts like we've never shortcutted before. Some wouldn't even call this cheating. They would call it the drive of play and say it's as fair as a ballplayer running the base paths without zigzagging. One person's cheating is another person's motivation to gain infinite lives, while playing Super Mario Bros., by hopping on a certain turtle on a certain staircase. It is also the reason why, if you can see another player's poker hand, you're not going to voluntarily forget it before playing your own. If we're going to play, we will bushwack the fastest path toward victory. We will find efficiency. We will recognize our ability to cheat and wrestle with our temptation to do so. We will possibly explode the system. Travel with me, in your imagination, to my gym in Brooklyn. You get no points for this. My gym is the YMCA in Bedford-Stuyvesant, a brick-faced building that houses a running track on its second level and a pool in its basement. I'd been going to the Y for a few months in 2010 before I started to register my visits on MyTown and Foursquare. I would have gone with or without the points, though I'm sure the Gamification folks would say the points added motivation, and I can't refute that. As I earned points for going to the gym, my ranking in MyTown for the Bed-Stuy YMCA rose. Each check-in was worth a base amount of points, sometimes multiplied by special virtual item perks or other factors added to the ever-evolving app. I enjoyed these points as a numerical bonus applied to the standard gym benefits of sore limbs, good health and an endorphin rush. I believed that I deserved my MyTown gym points, and I began to care, ever so slightly, about my position on the check-in leaderboard. With each check-in I climbed closer to the top of the rankings for my gym. I looked forward to being number one the same way I looked forward to running faster than the person on the treadmill next to me. I possessed, with my points, a new feeling of entitlement. Each of my visits to the gym deserved to be counted, to be scored, to be recognized. Such a feeling caused me to hesitate when I left the gym, just as I hesitated outside each of those shops in the Los Angeles airport. Gotta get the phone out of my bag. Gotta load up MyTown and check in. Gotta register those points I'd earned. Maybe it would be great if everyone wanted to earn points from their local gym. Imagine the increase in fitness as the points-hungry population scattered to their chosen fitness center. Think beyond gyms. Imagine the transformative effect if points-hungry husbands more frequently went to the supermarket, more kids to museums, more sinners to church. Gotta get that rank up. People would vie to become the Foursquare mayor of their local soup kitchen. Screw you, the app is saying. You are there. This is bad. Picture yourself, again, at my gym. You are standing in the lobby. You've got your phone out. You're checking in. Foursquare and MyTown allow you to identify where you are by selecting your location — a business, usually — from a list of nearby places. Perhaps you see that gym is listed. But there is a problem. The gym is listed twice. That's not the worst of it. You are standing in the gym, but the application tells you that you are more than 20 meters away from it. Screw you, the app is saying. You are there. This is bad. This lying application is designed to give you more points the closer you are to where you say you are. While you know that you are standing in the gym because you are standing in the gym, your app will tell you, nope, you're way off the bullseye. You're barely there. Less points for you. Remember, you deserve your points. If we are to live in a world in which we get points for being places, for flying around the world, for brushing our teeth, the implicit contract involved in these activities requires that we receive perfect credit. The first day that MyTown told me I wasn't really where I knew I was, that contract all but lost its staple and its pages flew loosely to the wind. I was not given the points I deserved that day. My ranking for the Bed-Stuy Y had become inaccurate. I had depended on technology to recognize where I was. I had prepared enthusiastically for an era in which human activity that formerly went unmeasured was now measured. And, in the lobby of my gym, I lost confidence. The MyTown people knew they had problems. They had found that GPS wasn't precise enough to get a fix on a city-dwelling MyTown user who needed to be triangulated in one store and not in another 10 feet away. Officials at the MyTown company, an outfit called Booyah, struggled with the very problems I encountered. GPS couldn't give them the true fix on a person, only an estimate. "Many variables can influence exactly how accurate that estimation is, including the signal strength, if a person is indoors or outdoors, among others," MyTown spokesperson David Diaz told me. By mid-2010, the Booyah people were trying to change MyTown to make it better at agreeing with the facts of where its users really were. The app's creators, Diaz said, "introduced a fidelity system that awarded more points based on how close we thought a player was to a location." Users found the flaws. The developers did too. Diaz shared an example that sounded all too familiar: "The device thinks you're at Starbucks and would've awarded 100 points, but in reality you're across the street at Subway, about 75 meters away, and as such, only got 50 points upon check-in." The app's creators changed their system — "shifted our logic" — and began using a method that de-emphasized calculations of proximity and instead let people choose from a list of nearby locations. The app now figures out, generally, where someone is, presents a list of 20 of the closest locations in the neighborhood, and lets them state which of those places is where they actually are. The MyTown people could fix their system, but they couldn't fix me. Their app had been flawed, but so was I. Sometimes I simply forgot to use it, forgot to check in. When I look back at my usage history of the competing FourSquare, I see stretches of days when I used the app dutifully. I registered at the pet store, then at the drug store, then the barbershop, all on a Saturday full of errands. Days such as that were followed by stretches when I forgot I had it. I sometimes left the gym without checking in. I sometimes forgot, but occasionally I remembered and simply didn't have time. I'd had enough activity in the gym and was ready to walk out. I didn't have even 30 seconds to load the app, select from the list of nearby locations and check in. By the time those 30 seconds passed, I would be out of the gym. I was on the move. If I'd lost my faith in today's Gamification technologies while I stood in my gym, I'd also started thinking about cheating those technologies when I was 20 feet outside of my gym. Long before it dawned on me that everyone around me was a potential cheater, I realized that I myself was one. I began to explore the reasons to lie. If a man has been to the gym and deserves points for it, would it be so bad if he checked in to that gym right after he left it? The conscious man can say "I am here," observe his surroundings and know what he has said is true. If he walks 10 steps, he can say the same statement again and the "here" to which he refers may fairly be understood as someplace new. But if he must register each claim through a gadget, if he dreams that doing so can provide a new accounting of his life, and if the application doesn't know the difference, why can't his "here" be the "there where he just was"? What if the application he used didn't know the difference? What if the application previously thought he wasn't exactly in the gym when he was? That's the kind of inaccuracy our man might take advantage of. Foursquare reserves the rights to strip cheaters of coveted "mayorships" and to remove people's abilities to earn points and badges. To make the system fair, to earn the points he deserved, might this man need to cheat and say he's at the gym even though he just left it? Is that even cheating, especially if this app previously robbed him of fair credit? Throughout the spring I was fascinated with these ideas that people would cheat using Foursquare and MyTown and that they might cheat with good intentions. They might also cheat because they saw the loophole. They could walk through an airport checking into stores which they never entered. They could rack points for presence that was false or fleeting. They could climb rankings and earn mayorships they didn't deserve. Isn't that what a quest for points might drive a person to do? I wanted to cheat when I left my gym, just to make things fair. And if others would cheat for wrong purposes — to beat me — then surely I could cheat for purposes more noble. Erin Gleason, a spokesperson for Foursquare, told me that "cheating hasn't been a widespread problem" among its nearly six million users. 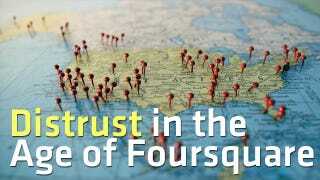 Cheating must have been enough of a temptation, however, for Foursquare to guard against it. They watch for cheating in many ways. Looking for false check-ins, the company monitors the speed with which people check into locations and the distance between each place where a person registers. Foursquare reserves the rights to strip cheaters of coveted "mayorships" of frequently visited locations and to remove people's abilities to earn points, badges and future mayorships, the company rep told me. They also empower people who own a given Foursquare venue to strip the title of "mayor" from a user whom they feel hasn't earned that title honestly. Foursquare regularly "tweak[s] our algorithm for cheating detection" because, Gleason noted, "as with any game, you have to deal with people who try to bend the rules." Exactly! These Foursquare people know this truth as well: if something is gamified, some of its users will ensure it is cheatified. Briefly, Foursquare and MyTown did affect where I went. They made me more willing to stop in one more pet store to look for cat food and added an extra nudge of motivation to drop into the supermarket. The effect was temporary, because I didn't trust the system to work correctly. I kept leaving places without remembering to check in. I kept finding myself stopped near a doorway, spending 30 seconds inputting my current location and realizing all this checking in was slowing me down. Soon, I was deciding it was too much of a hassle to check in this time. Maybe next time. I was mired in a modern existential quandary. I'd come to recognize the fact of being somewhere as something quantifiable. Being somewhere — simple presence in a specific location — was a condition that MyTown and Foursquare allowed me to perpetually register and map. The prospect of a forgotten or inaccurate check-in wasn't merely a setback in the quest for points, but it was an added imperfection in the drafting of a map of my life. I grew anxious about the errors in such measurement. I imagined there could be an elaborate overhead view of New York City inked with an angular scribble that represented a month of my journeys. A line darkened by repeated criss-crossing would represent my commutes between Brooklyn and Manhattan from home to work . Lines of medium thickness would represent my walks back and forth to the gym. A slender single line would show the one time in the month when I went to the movies. Some off-shoot might represent the beginning of a trip off the map to my parents' home, another a trek to Queens for a birthday party. A couple of parallel spokes would point toward midtown Manhattan for the purchase of comic books. This map could chart me and, roughly, explain me, the way a sensor can track and explain the trans-Pacific migration of fish. Imagine such a map, but imagine the impact of its possible errors. An un-registered trip would be lost from that map of my life. A mis-registered trip would place a dot — would place me — where I hadn't been. I wanted to think of the tracking of my movements in positive terms. Foursquare, MyTown or any other location-registering application could map the previously unseeable truth of my moving presence, or it could gather such information poorly and get me wrong. I was as culpable for the accuracy of this system as the applications themselves were. It made little difference if MyTown believed I was standing 100 meters away from the gym I was actually in or if I simply left the gym without remembering or choosing to register that I was there. The opportunity to take an accurate tally of this new measurement of me would be missed. That's another reason why I was sometimes tempted to cheat, in a manner that felt corrective. If I was to check in at the gym after I'd already left the gym, I would not be undermining a system; I would be making it work right. To think of using a location app to map oneself is to yearn for technology to reveal an added truth about oneself. That's the kind of raised expectation that just might not be compatible with today's location apps, especially not when you find yourself competing with the liars among us and what I can best describe as ghosts. Some members of the MyTown team used to work on World of Warcraft. They brought to MyTown an expertise in hooking people. Their application lets users "buy" the places they visit, upgrade those locales and in a very abstract way receive rent payments based on how many other people visit the location. When you check in, you earn points, points that may be multiplied with the use of special power-up items. Some of those point-boosting items are tied to real stores and only work if you're there, which is key to MyTown's hopes for business partnerships and profit. The folks behind MyTown hope, for example, that I'll want to use an item I can only earn by checking in at the H&M clothing store, a shop to which no line on my personal map wound normally connect. The points you earn in MyTown are also tallied and counted toward the achievement of new user levels. Advancing to become a Level 10 or Level 14 MyTown participant earns the user new capabilities, just as it would in World of Warcraft,. In the case of MyTown, such empowerment enables a player to upgrade buildings more impressively, to own more properties and other feats. The points you earn are also added to your rank on a leaderboard for each location. Through such a leaderboard I was able to watch, throughout the spring of 2010, my march toward the top of my gym's rankings. I may have wanted to map my existence with the help of MyTown, and that may be one of the reasons why it mattered to me whether MyTown worked the way it should. I also, simply, wanted to be first. Those ex-World of Warcraft people had hooked me. I wanted to rank up. I couldn't lift the most weights in my gym, but surely, I could be the number one MyTown visitor to the Bed-Stuy Y. This desire made imprecise check-ins more frustrating. It made inaccurate check-ins feel like an affront to the rules of fair play. Remember that sense of entitlement I said these applications encouraged? My climb up the MyTown rankings for my gym in mid-2010 was steady but confusing. Last spring, MyTown was still using CitySearch and possibly other databases that wound up double or triple-listing my gym. Existential quandaries, indeed. I was sometimes checking into one version of my gym, sometimes into the other. On Earth I was in the same place. In a virtual accounting of Earth I was in one, the other or both. I began to wonder who the other people on the rankings for my gym were. I wondered if they were active users — the guy at that treadmill over there? the lady on the exercise bike? the kids goofing around near the weight room? — or if I was competing with people who had either bailed on MyTown or bailed on my gym. I didn't know if my rivals were of the past or the present. I wondered if the other people on the rankings for my gym had noticed me on the points list. Had they seen me as some mystery man passing them by? I wondered if they cared. I wondered if they too sometimes forgot to check in or failed to get the proximity points they felt they deserved for standing in the gym. And I wondered if any of them was cheating. The fact is that somebody was cheating. Maybe they all were, but I can say with confidence that "Judy" was. The fact is that somebody was cheating. Maybe they all were, but I can say with confidence that "Judy" was. I know this because I remember the day I was on the verge of reaching the top position on the MyTown ranking for my gym. I instead vaulted into a new version of second-place behind "♥ Judy ♥ ♥," a brand new person on the leaderboard whose score for gym visits was more than 10 times mine. At that moment my confidence in humanity's ability to self-report where they stood dimmed even more. I'd suspected people would cheat and now I had proof. People were cheating for bad reasons and for good, I figured. The cheating was everywhere. I now had confirmed to me the ugliness of human nature that's usually revealed only to confessors and tax attorneys. There was every reason for everyone who used these location apps to be lying. You all must be doing it, I believed. Everyone around me was, probably, a liar. Of course, some of them might be lying for the right reasons. I was annoyed that someone else had cheated. Despite temptation, I had never done so. I'd never claimed to be in the gym after I'd walked out of its doors. As so many do when suffering an injustice, I swore off MyTown. If we were being promised a future in which we would be fairly counted for where we stood, then what to make of the horror of being counted incorrectly? This imperfect census, this mercurial yardstick, this infestation of liars... I was done with it. Temporarily. By the time I resumed using MyTown in late 2010, things were changing. The makers of MyTown are like the makers of many successful iPhone apps. They routinely update their software, improving and reinventing their systems. I had noticed that many of their updates appeared to target potential cheaters. They often tweaked, for example, the number of daily check-ins people could submit, implying that some people had become overzealous in reporting the places they'd supposedly been in a given day. Months later, shortly after I began using MyTown again, I discovered that one of the big changes was the program's shift to a reliance on a new database of locations. When I next tried to check into my gym, I couldn't find it. The Y I'd gone to had been scrubbed from the database. The only thing more head-spinning about the idea of not receiving accurate credit for checking into the place you are standing in is discovering that the place you are in is no longer considered to exist. By last fall, MyTown was listing a new version of my gym. It was that second listing I'd sometimes checked into, but not the one where I'd nearly reached the top of the chart. Right before the database switch-over I managed to get one or two check-ins to what I'll call the prime version of my gym. I was using a new iPhone, though, and I'd not managed to sync it with my old phone's MyTown account. As a result, before I encountered the trauma of no longer being able to check into my gym — of having a place pulled from the map like it was East Germany or, worse, an island sunk into the ocean — I experienced the peculiar circumstance of competing with myself. From my new phone, I checked into my old gym as "unknown". I claimed a low ranking. Higher, now in the fourth spot below some other probable cheaters with gaudy points totals, was Stephen Totilo. Hey, that's me! A few weeks later, neither "unknown" nor Stephen Totilo could check into the Y. It was off MyTown's charts. For some reason I can still see the old listing for my gym in my copy of MyTown, even if I can no longer check into it. When I remember to check in using the new listing — really, when I care to — I am climbing a new ranking, still known only as "unknown." I can, however, swipe over to that original listing and see the rankings frozen in the amber of iterated technology. There's old me and new me and that damn cheater who claimed the top spot. I like that listing. It's a failure monument, it's a bad map, like the ones that used to put Europe directly east of the edge of the earth. Foursquare rep Erin Gleason likened cheating at that app to "stealing Monopoly money from the bank in a game with friends — you'll ‘win' but you're totally missing the point." MyTown's David Diaz said plainly that the point of the app is for people to be where they say they are: "In MyTown the goal was to have players check-in to the locations." Surely there's a limit to how much they care about our truthfulness. All either outfit really needs is its users to operate on the same playing field. For things to be balanced, if one person is honest, everyone needs to be honest. If one person juices, everyone must. But if I never cheated at MyTown, perhaps I should assume everyone else can or did resist too. I doubt it, though. The promise of points is great and, hey, is it cheating if the tech can't really tell where you exactly are and sometimes needs to be fooled to balance the times it itself was a fool? By the end of 2010 I wasn't much of a MyTown or Foursquare user anymore. I'd enjoyed them conceptually. I'd become enamored with the idea of mapping my movement and may someday enjoy some future version of these apps that requires no conscious act of checking in. Their legacy for me is one of skepticism about what the game-ifying of our lives can trigger. Maybe we do deserve as many points for being in the supermarket as we do for eating a ghost in Pac-Man. Maybe our normal actions deserve to be counted. But they will not be counted without imbuing us with a sense of entitlement, a sense that we deserve more rewards without doing more things. And we may gain paranoia, because we may trust these newly counted parts of our lives — the games of our lives — to be based on the truth. That faith will be damaged as we learn the extent to which we will lie about where we lie.